"Rolled in pine nuts with a soft, chewy center." Break almond paste into pieces and mix together with sugar, using your hands to crumble paste. In a separate bowl, separate the eggs and beat the whites into soft peaks. Slowly add to almond paste mixture and mix until just blended. Place pine nuts into bowl. Roll dough into 1-inch balls and press into nuts. Coat evenly and place on cookie sheets about 1 inch apart. Bake 15 to 17 minutes, until lightly golden. Let cool on cookie sheets for 5 minutes, then transfer to racks. My grandma makes these all the time. They are the best. The dough supposed to be wet and it kind of looks wrong but thats the way it supposed to be. A great alternative to almond macaroons. 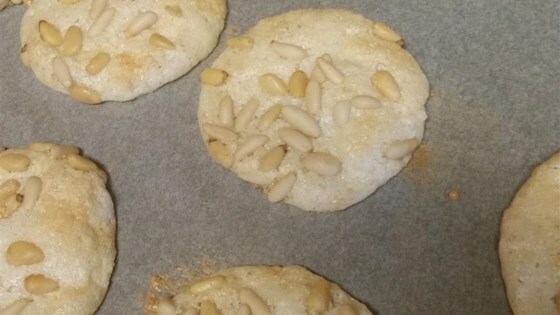 Do you bake the pine nuts before using them in this recipe? Or does it matter?